Tom Dixon Studio's new hub opened a few weeks ago. The Coal Office, located on Granary Square, in King's Cross is part of a new urban creative and technological network and falls within the sphere of the redevelopments in the area around the major transport hub in the north of London. 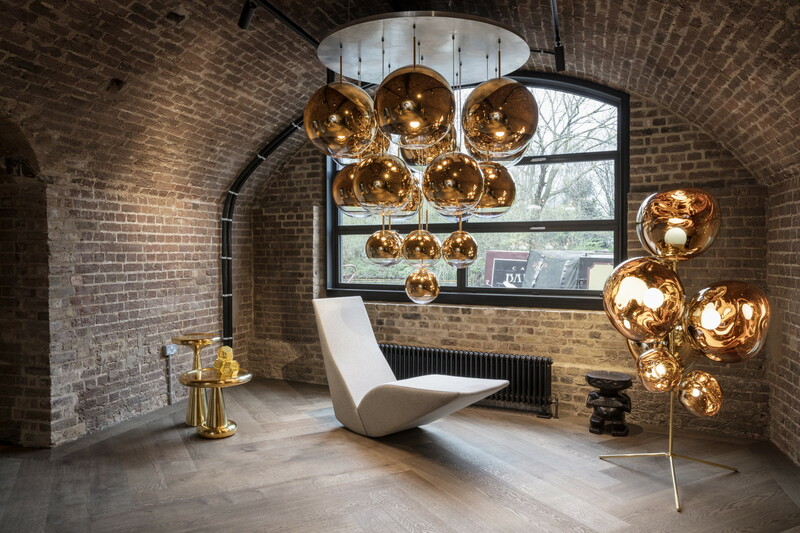 British designer, Tom Dixon has opened a new flagship store, showroom and offices in a group of Victorian buildings in King's Cross, London, really buzzing with all the refurbishments. The Central Saint Martins Art College opened its doors in a granary renovated by Stanton Williams in 2011, while an extension to the station designed by John McAslan + Partners opened in 2012. The site is still expanding and the likes of Facebook and Google are also about to move their headquarters there. Tom Dixon's new hub is located in the Coal Office buildings, built in 1851 when along with the Coal Drops Yard, they formed the focal point for the distribution of coal around London. The Coal Office curves alongside the Regent's Canal near the Thomas Heatherwick-designed Coal Drops Yard shopping centre, which is slated for completion in October 2018. The Coal Office buildings were refurbished by David Morley Architects then Tom Dixon Studio took over the project to design the interiors. The British designer wanted to give the project some sense, so he left the brick walls exposed and matched them with pale and coal-black wooden parquet. The Dixon brand furniture and lighting turn it into a real business card for the company's operations. Tom Dixon Studio will also continue to run an onsite restaurant – like at his previous premises. As he says: "For us it was imperative not just to find a new office or shop. It was vital to find a new home. London isn't just another city. It is where it all started. We will use these 1,625 square metres in this incredible location as a platform to broadcast our latest ideas in interior design, product innovation and experiments in food, functionality and future living".